ABC News 7 has revealed the 5 camera sites in Montgomery County grossing more revenue than any others in the county's program. 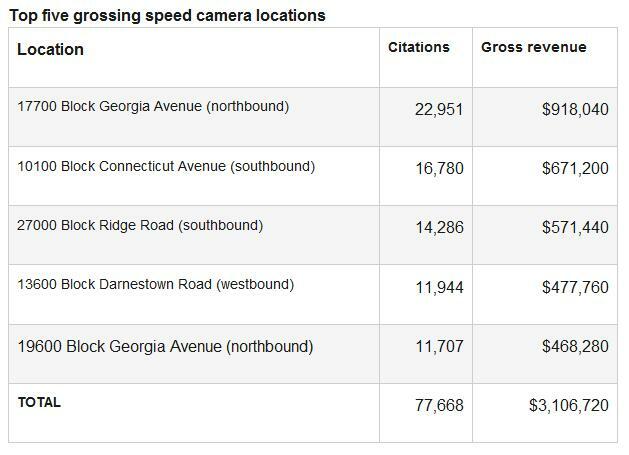 77,668 citations were reportedly issued by these 5 cameras, bringing in a total of $3.1million in revenue for a 12 month period ending in August. The county's contractor, ACS State and Local Solution, received a $16.25 cut out of each citation, or $1,262,105 from these 5 cameras sites alone. The top grossing camera, at 17700 Georgia Ave Northbound, is in a particularly ideal location. The camera is place 0.1mile located a just few yards outside a posted school zone. Montgomery County is uniquely permitted to have speed cameras outside school zones, and due to a loophole in the law the cameras posted outside school zones are permitted to operate on weekends whereas school zones cameras are not. Yet the presence of the school zone close by still permits the county to claim the school as justification for having a camera enforcing the lower speed limit in this location even though they are not subject to the restrictions which come with that. We previously documented the fact that according to the county's own report, as of June 2009 80% of camera sites located in Montgomery County were not located in designated school zones. A similar situation applies to the camera at 13600 Darnestown Road, where a 40mph speed limit is dropped to 30mph and the camera placed 0.1mile down the road, and no posted school zone, a fact which we reported on shortly after that camera was installed.